Texas Gov. Greg Abbott is sparing no expense — or attack — as he works to unseat a fellow Republican, state Rep. Sarah Davis of West University Place. After spending six figures in January on ads for her primary challenger, Susanna Dokupil, Abbott is launching a third TV ad in the district, one that solely criticizes Davis without mentioning Dokupil — and doubles down on a line of attack that Davis has already called the "most disingenuous" one she's ever seen. "She twists and turns to hide how liberal she really is," a narrator says in the 30-second spot, which features images of Davis on a spinning coin. "Sarah Davis: not just a liberal — a liberal you can’t trust." While the ad attacks Davis over abortion and ethics reform, it most notably revives Abbott's contention that a bill introduced by Davis during last summer's special session would have interfered with the state's ability to respond to Hurricane Harvey had it passed. As introduced, House Bill 25 would have tapped the state's multibillion-dollar savings account, known as the Rainy Day Fund, to partially reverse a 2015 cut to disabled children’s therapy services. The bill was later amended to instead draw its funding from the state's Disaster Relief Fund, which the governor's office has since used to distribute more than $100 million for Harvey-related issues. Davis opposed the amendment, which was offered by Fort Worth state Rep. Matt Krause, a Republican and member of the conservative House Freedom Caucus. Speaking against the amendment on the floor, Davis expressed discomfort with tapping the disaster fund for such a large amount, especially due to her Houston-based district's vulnerability to natural disasters. The ad skips over the procedural history of the bill and seeks to make Davis responsible for the final version of the bill, which unanimously passed the House before dying in the Senate. Davis "wants to protect the disaster relief funding that Houston desperately needs," the narrator says. "But her own bill would have taken that money away." Abbott first used this line of attack while speaking at a fundraiser for Dokupil last month. After his remarks surfaced, Davis called it "the most disingenuous attack – that’s using the tragedy of Hurricane Harvey to score political points – that I have seen." Davis responded to the ad on Twitter Wednesday, saying that “nothing in Abbott’s new attack ad is true.” On the claim about HB 25 in particular, Davis pointed to video of remarks she made on the House floor at the time in which she said she was “not comfortable” with using the disaster relief fund to pay for the proposal. 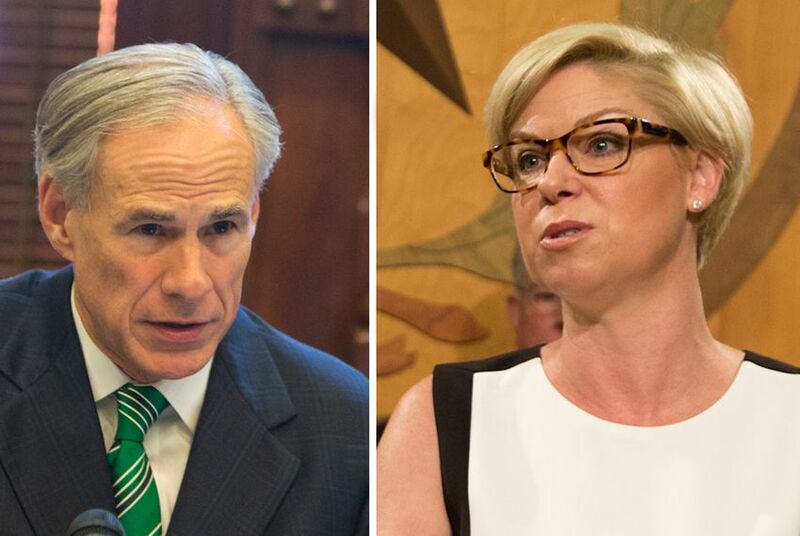 Davis is not the only incumbent Abbott has endorsed against ahead of the March 6 primary — but he appears to be doing more to unseat her than anybody else. The ad released today is the third commercial that his campaign has funded in the race, and it comes after the campaign says it unloaded $161,000 on ads for Dokupil in January, the vast majority for TV. Davis appears to be taking the threat seriously. Earlier this week, she reported raising $223,000 between Jan. 1 and Jan. 25 — the latest fundraising period — and spending $78,000, giving her $245,000 to spend in the home stretch of the race. Dokupil disclosed $258,000 in contributions, $81,000 in spending and $88,000 cash on hand. Early voting for the March 6 primary starts on Feb. 20.